Woot Woot! I’m trying to find everyone, so if I haven’t found you, follow me and I’ll follow you back! Yes, I’m at grad school. And yes it’s a lot of work. And yes sometimes I feel overwhelmed. But when it comes down to it, I’m spending my days lounging around reading books. Whether comfortable in a porch rocking chair or cuddled on a couch in the library, it struck me that not many people can afford to spend their days like this. Reading for 3-6 hours at a time. And when I drive around down here, it becomes glaringly clear that the opportunities I have would be considered luxurious to a lot of the people around me. I don’t know why I’ve been given such a good life. Good family. Good home. Good education. Good health. It probably has a lot to do with this good country I live in. So as much as I complain about the politics and the current state of education, I do see how lucky I am. The last three days have been LONG. Packed up my classroom, packed a car full of stuff to take to graduate school, and unpacked a two car loads (one brought, one bought). I want to say I slept soundly last night, but instead I was so excited to be here and start classes that I woke up practically every hour thinking: I’m here! This is nice! I want to go to class! I want to write in the library! No internet access right now due to some glitch on campus with Macs not being able to connect to the WiFi. I came to Panera to log on briefly (I needed dates and times of all these meetings I have to go to… which were e-mailed to me… go figure). And the internet being down might be a good thing… no Facebook to distract me from reading and writing! My home page is iGoogle, which allows me to have all these lovely little gadgets. But I’ve also discovered a fantastic other use for it. I’m inputting important conference registration dates and grant application dates. For example, there’s a local conference that fills up quickly in the fall, so I put in the registration date, and now I can keep track of how many days until I can start checking of registration info (still 87 days to go). There’s also a grant I want to apply for through SCBWI, but I can’t submit the application til February, so I put in a countdown for that too. And yes, I could just do this on a calendar or in a planner. But I’m not terribly good at using either. I try. I use my computer every single day. I figured this was an excellent way to keep these dates in my sphere of attention. Anyone else struggle with keeping track of dates? I run a Harry Potter club after school, and tomorrow is our last meeting of the year. The HP logo and the snakes were the hardest. My brother suggested I do a Gryffindor lion in red icing… Ummm. NO. 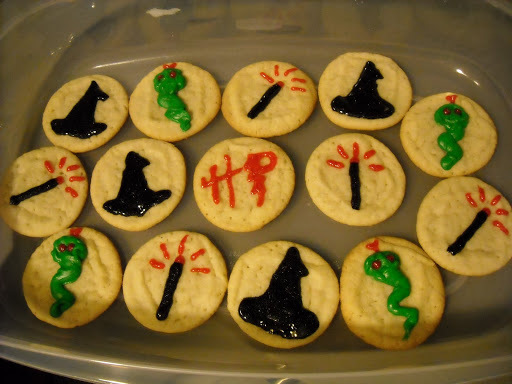 PS- I listened to A Very Potter Musical while creating these cookies. If you don’t know what that is, your life is not complete and you’re not a true Potter fan. Click below. If you want to write children’s literature, you should join SCBWI (Society for Children’s Book Writers and Illustrators). They send you all kinds of awesome newsletters and info about the world of children’s publishing. You can join even if you aren’t a published author. I joined this year after a recommendation from one of my grad school professors, and have been really impressed with everything they’ve sent me. They also hold two BIG conferences each year. The summer conference is in Los Angeles. The winter conference is in New York City. Yeah. They’re all kind of a big deal. One workshop is taught by Arthur A. Levine. The editor who did Harry Potter. The workshop was already sold out. Not that I would have the $1,000 dollars it would cost to fly out to LA and go to this thing. Especially not after the $8,000 worth of grad classes this summer. But if I could make that class happen… if I could take a class with the guy who published Harry Potter… I would. I have never seen more mullets, missing teeth, or pick-up trucks than I have in the last few days. I’ve seen men twice my age with hair as long as mine. HOWEVER– the customer service and politeness everywhere I go is refreshing. Please, thank you, my pleasure, and smiles have been my experience at every store and fast food chain I’ve been to. So, southern hospitality is definitely a reality.